Ray Hardy is living the good life. He’s retired, in good health and playing a lot of golf. On a good day, he breaks 80 at Umstead Pines Golf Club in Durham. Hardy plays with a group of regulars, so he never has trouble finding a fourth. They’re a good bunch, but he points out that all of them are much younger. When you’re 92, everyone else in the foursome is just a kid. Hardy’s story is a special one. He never had designs on playing professionally or building a career in the golf industry. For most of his life, he was a weekend golfer. But his love for the game has allowed him to play minor roles in the storied history of the game. He grew up in Ligonier, Pa., mowing grass with a push mower at Latrobe Country Club. The head pro was Deacon Palmer, whose son Arnie didn’t quite have Ray’s work ethic. Later, Hardy served in World War II as a quartermaster on a landing craft tank in the battle of Okinawa. Then it was on to college, where he met his future wife and had two boys. Early in his career, he managed a Winn-Dixie supermarket in Florida. Before long, he went into the wholesale produce business. He remarried, doubling the ranks of boys to raise with his second wife, Jill. Those were busy years. Hardy was a bogey golfer, lucky to squeeze in 18 holes once a week. As time passed and his produce business grew, Ray and Jill began spending their Octobers in Durham, where they had family. He retired in 1988 at 62, calling the Bull City home permanently. 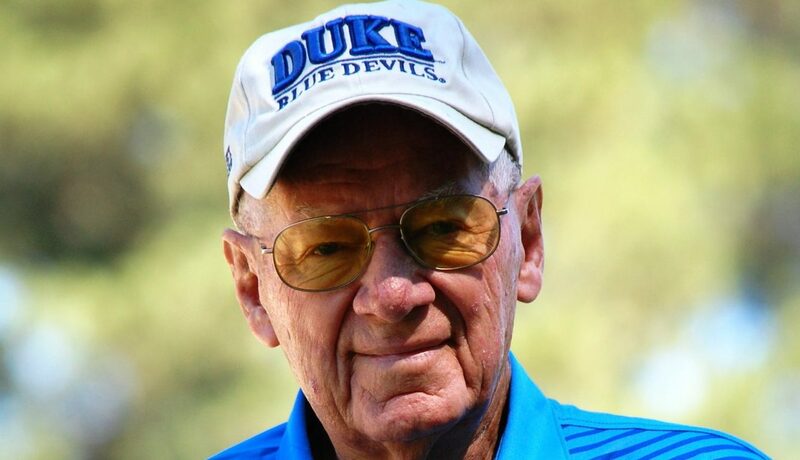 He built strong ties in the Durham golf community, first with Rod Myers, the longtime men’s golf coach at Duke University. 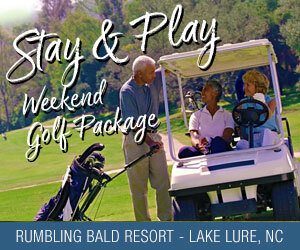 The two became friends and Myers hired him to be a ranger and starter at Duke University Golf Club. That’s where he befriended Dan Brooks, the current Duke women’s golf coach more than 20 years ago. In the early days of the women’s golf program, Hardy was Brooks’ right-hand man. Among his many unofficial duties was shuttling the team to-and-from the airport for tournaments. His volunteer efforts didn’t stop there. For 18 years, he served as a marshal at the 16th tee at the Masters Tournament. His run ended when his best friend ran over Hardy’s leg. That unfortunate incident was four years ago, in his late 80’s. You might think getting run over by a car would slow him down. “No, I’m fine now,” he reports. For most golfers in their 90s, one of the few remaining milestones is to shoot one’s age. The trade off – gaining a stroke while losing a calendar year – is hardly a fair exchange with the passage of time. But Hardy’s game deserves more than a tip of the cap for posterity. He has no explanation for his rare combination of longevity and high-level golf, but he knows better than to sit back on the couch and feel satisfied. Many former Duke golfers would agree. So what are chef Ray’s best entrees? And usually that means back to Umstead Pines the next morning. Not much has changed about Hardy’s game during 30 years of retirement. He did make one concession to the game 20 years ago. He moved from the white tees to the senior tees. Hardy is a self-taught golfer. He took a lesson once when he was concerned that he had developed a fade. The pro told him not to worry about it, so he never went back. And really, why bother? We’re talking about a guy who shot a 70 at Augusta National Golf Club at age 75. The game has been good to Ray Hardy. He enjoys the fellowship of playing with men in their 60s and 70s. Until last year, he played Sunday golf with Jill, herself an 18 handicapper at her best. He has five holes-in-one to his credit, the last one at age 87, a pitching wedge from 109 yards. As for shooting his age? Hardy won’t hear of it. There are too many really good rounds to be played, beginning tomorrow morning.